I’ve been on the road a lot over the past week and this poor old blog has suffered as a result. This is not to say I haven’t been collating information and forming musical thoughts while I drive, but getting to a computer has proved difficult. So here’s the Saturday summary on Monday, just a couple of days later than planned. For those of you who follow this blog, you might know that Room Thirteen published my article about Jacob Golden as their feature ‘Artist of The Week’. If you haven’t already visited their website, I recommend doing so. I have also been putting plans in motion for some more ‘Acoustic House Gigs’ so watch this space. 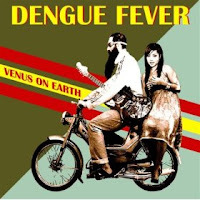 The formidable ‘Chalky Choice of the Week’ award went to Dengue Fever with their superb Cambodian pop/ psychedelic rock album, ‘Venus On Earth’. Bob Dylan opened an exhibition of his paintings at the Halcyon Gallery in London. George Michael said his days of touring big venues are now over (thank God) but of course he's doing a couple more shows before he reaches this landmark. Encouraging reviews started circulating about the soon to be released film about Welsh poet Dylan Thomas called ‘The Edge of Love’. The soundtrack to the film includes performances by Siouxsie and Beth Rowley. Siouxsie stated she performs one song for the soundtrack and that Keira Knightley sings on three tracks. Yes, here is the link if you are interested in hearing Keira singing –husbando? Artists I've been listening to: Dengue Fever, Fleet Foxes, The Cool Kids, 3:10 To Yuma Soundtrack, The Challenge of Feral Green, Aesop Rock, Caribou, The Dodos, The Felice Brothers. Incidentally The Dodos performance (April 23rd 2008) from Amoeba is now available on Amoeba along with a free download courtesy of the label. Click here for the link. Thanks to Rameen @ Amoeba Records for bringing this to my attention. I also now have a link to my videos on YouTube here.